Warren Buffett has been an active investor, business magnate, and philanthropist since 1951, and he's still going strong. He's considered one of the world's most successful investors, and his net worth of $87.1 billion dollars as of August 30, 2018, makes him third on the list of wealthiest people worldwide. Buffet has a longer track record of success in beating the market than any other legendary investor. Buffett acquired a textile firm named Berkshire Hathaway in 1965 and later used the same name for his diversified holding company. Since 1970, Buffett has served as Berkshire Hathaway's chairman and is also its largest shareholder. Berkshire Hathaway's stock price has hit many new highs, with its most recent at $335,900 per share for BRK.A. 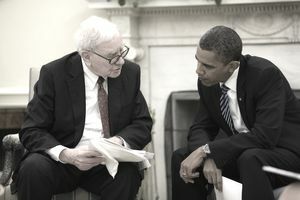 Many media outlets refer to Buffett as the "Oracle of Omaha" or the "Wizard" because of his successful value-investing strategy and the way he lives with such frugality in his personal life. Buffett is a well-known philanthropist and has pledged that he will give away 99 percent of his wealth to support philanthropic causes, mainly through the Bill and Melinda Gates Foundation. "When Berkshire buys common stock, we approach the transaction as if we were buying into a private business." "Accounting consequences do not influence our operating or capital-allocation decisions. When acquisition costs are similar, we much prefer to purchase $2 of earnings that are not reportable by us under standard accounting principles than to purchase $1 of earnings that are reportable." (When speaking of managers and executive compensation) "The .350 hitter expects, and also deserves, a big payoff for his performance even if he plays for a cellar-dwelling team. And a .150 hitter should get no reward, even if he plays for a pennant winner." "Many stock options in the corporate world have worked in exactly that fashion: They have gained in value simply because management retained earnings, not because it did well with the capital in its hands." "We do not view the company itself as the ultimate owner of our business assets but instead view the company as a conduit through which our shareholders own assets." "Do not take yearly results too seriously. Instead, focus on four or five-year averages." "Focus on return on equity, not earnings per share." "Look for companies with high profit margins." "Is management candid with the shareholders?" "Does management resist the institutional imperative?" "Does the business have favorable long-term prospects?" "Does the business have a consistent operating history?" Warren Buffett's investing methods have some common themes. Among them, he insists that buying stock in fewer companies serves investors better. He recommends buying stock in companies in which investors have a personal interest, such as being a consumer of the company's products or a lover of the company's business philosophy, to bring greater stock portfolio returns. He also feels strongly in holding onto stock investments for the long term. "Unless you can watch your stock holding decline by 50 percent without becoming panic-stricken, you should not be in the stock market." "Why not invest your assets in the companies you really like? As Mae West said, ‘Too much of a good thing can be wonderful.'" "Risk can be greatly reduced by concentrating on only a few holdings." "It is optimism that is the enemy of the rational buyer." "The ability to say ‘no’ is a tremendous advantage for an investor." "An investor needs to do very few things right as long as he or she avoids big mistakes." "The advice ‘you never go broke taking a profit’ is foolish." "It is more important to say ‘no’ to an opportunity, than to say ‘yes.’"
"Always invest for the long term." "Stop trying to predict the direction of the stock market, the economy, interest rates, or elections." "Buy companies with strong histories of profitability and with a dominant business franchise." "Much success can be attributed to inactivity. Most investors cannot resist the temptation to constantly buy and sell." "Lethargy bordering on sloth should remain the cornerstone of an investment style." "An investor should act as though he had a lifetime decision card with just 20 punches on it." "Growth and value investing are joined at the hip." "Remember that the stock market is manic-depressive." "Buy a business; don't rent stocks." "An investor should ordinarily hold a small piece of an outstanding business with the same tenacity that an owner would exhibit if he owned all of that business." Where Can I Find Warren Buffett's Letters Stockholders?